Passed your classes? Pass the camera. Congratulations graduating class of 2017! Your convocation is a special day, not just for you but for your family and friends who helped you get to this point. Since graduation no longer takes place on-campus it might be a good idea to come back to the place you’ve spent so many years and take some memory photos with friends and loved ones..
Here’s our list for the best spots at the Lakeshore and North Campuses to snap some great grad photos. If you are looking for a unique, picturesque photo opportunity, the beaches at Lakeshore are perfect. If you go on the right day, you can get some stunning pictures. I took my LinkedIn photo at the Lake, and if you go to the right spot you can see the Toronto skyline in the background. The entire building has so much potential for a fantastic photo. The top floor has a rustic, unfurnished wooden roof, with beautiful windows. The new addition has a glass wall, with an amazing view of the courtyard behind it. The Centre for Entrepreneurship shows the perfect contrast between old and new. Any of the red brick walls around campus are classics. It may seem a bit predictable, but there is a reason everyone takes photos next to them. Nothing says Lakeshore quite like the warm glow of red bricks in the sunlight, capture those memories for years to come with a photo. The courtyard is finally open, and it looks amazing. This is likely the best location for a large group photo on campus, and if the weather is right, the sun shines beautifully off the buildings in the background. You can take a picture sitting on one of the nice rocks! L Building may bring your memories of late night group work sessions or remind you of how frustrating it is when tables are taken by high-school students, but it also offers some fantastic photo-ops. The glass windows give you the opportunity to pose with the entire campus behind you. The Arboretum is a perfect place to take pictures with family and friends (a lot of people come here for wedding photoshoots!). Whether you’re on top of the hill or overlooking one of the ponds it is a picturesque setting. The rock face in the Arboretum is a cool place to take a “Band Photo” with some friends. 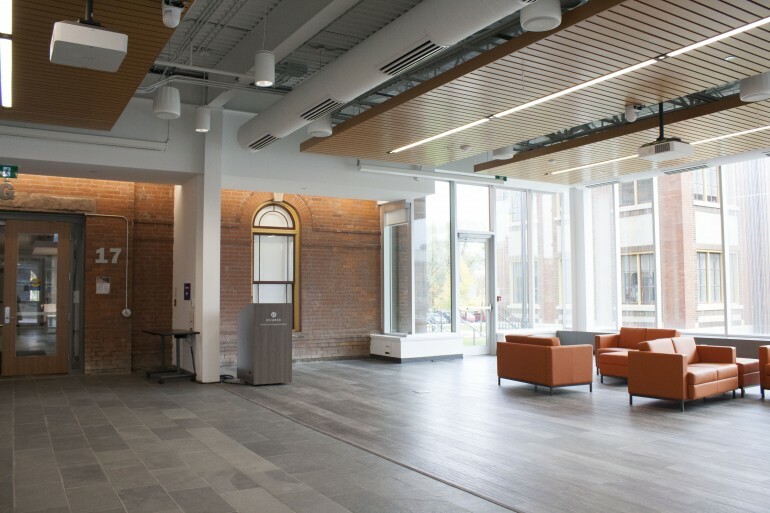 This location isn’t for everyone, but if you spent a lot of your days shooting hoops on the basketball court or played for a Humber team, taking pictures in the gym might be the perfect spot for you. Take photos with trophies, teammates, or coaches. A classic spot for taking Photos at North Campus is along the walkway in front of the LRC. On a beautiful day the sunlight reflects gloriously off of the large panes of glass, providing a great photo opp. After all, for many students at the North Campus, this is where it all began! If you’re a GH student it’s a must to get a photo with the plant wall. There isn’t much to say about this one other than the fact this wall is iconic. Even if you’re not from GH, the wall is beautiful enough to consider crossing the bridge for. The Gratitude Hall in North Campus is a perfect spot to show your appreciation for your time at Humber. We wish you all the best of luck! Remember you can take the Hawk out of Humber, but you can’t take Humber out of the Hawk! Before you leave make sure to check our list of the 7 things you MUST do before graduating. Also make sure to check out our advice on adjusting to life after graduating. Make sure you share your grad photos with us on social media @ShareIGNITE! Not graduating quite yet? Check out advice that our grads had to give to first year students.